The .60-acre property at 615 Beachland Blvd. that recently was home to an Ace Hardware store is being redeveloped by a local family and will become an interior design store/studio. A building on the site that dated to 1981 was a Hale Groves Fresh Fruit retail store for a number of years before the hardware store leased the premises. Most of that building has been knocked down by the Hill Group, which is the contractor on the project. Eilis and Jeffrey Powers last summer bought the land and building from Hale Groves, one of the largest mail-order citrus companies in the United States, paying $2.25 million. 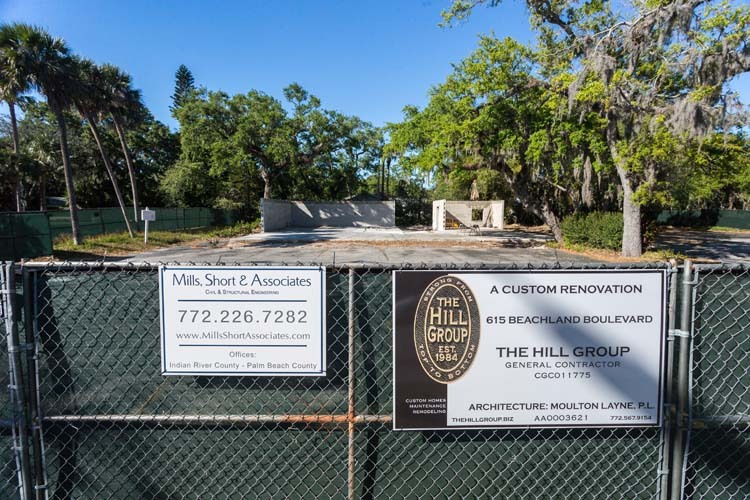 The Hill Group removed the hip roof and all but two walls of the 4,500 square-foot building, which sits on a square 148-foot by 150-foot lot. Eilis Powers is an interior designer and will open “VB-home,” offering design services and “a large inventory of high-quality home furnishings stocked right here on the barrier island,” she said. She hopes to have the business open by fall. The building and parking lot footprint will stay the same as when the hardware store was operating, according the site plan approved by the City of Vero Beach Planning and Development Department. The Powers, who had visited Vero Beach since the 1970s, moved here permanently in 2012 after selling the family business, Powers Fasteners, to Stanley Black and Decker. The company manufactured anchoring and fastening products for concrete, steel and masonry structures.